‘It’s a Knockout’ – a program full of big, BOLD events like the gameshow. You will love this unique team building activity, even if you were not around for the 1970’s Knockout style TV show. 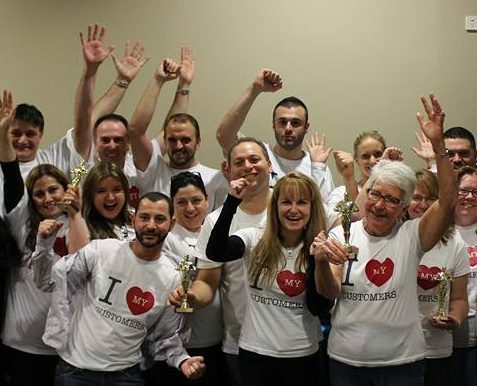 The Team Building Company’s ‘It’s a Knockout’ activity is a high energy, colourful and fun event guaranteed to be engaging, competitive, interactive, and a great laugh. We have a selection of large scale inflatable games and activities to offer. We put these together alongside more traditional team focussed activities and challenges. Throw in a giant scoreboard, sound system and genial host. The result is a spectacular event for those who experience it. ‘It’s a Knockout’ team programs are like the physical gameshow, with teams battling it out in a number of fun, challenging activities. Knockout has a balance between ground based activities and giant inflatables, as teams rotate and play their ‘Joker’ for points and a jump on the rest. How will each team perform together? The activities involve climbing, sliding, navigating over, in and out across the numerous the team challenges. With a wide selection of activities, Big bash and ‘It’s a Knockout’ can be the corporate gala team event of the Year or a inspired reward for high performance and success. The MC’d event can be themed and include specific inflatables according to the program. This means we can design the program to suit your needs and abilities. 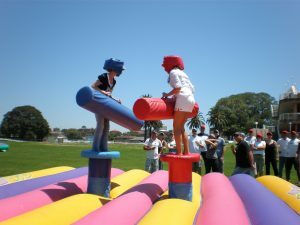 Knockout has the gameshow style inflatables like Gladiator, FussBall, Horizontal bungee, Obstacle course or Dual pole joust. The main defining factor of an ‘It’s a Knockout’ event is the number taking part. For larger groups, even several hundred people, we have the resources and experience to put on a major show. We also provide an alternate version for smaller groups or team building on a budget. ‘Big Bash Sports’ are fun team building games available in Sydney, Melbourne, Canberra. It is an event like no other and is bold, competitive and fun. Physical and mental activities await the teams as they prepare to battle it out. In ‘Big Bash Sports’, challenge each other in a demonstration of skill, judgment, talent, and luck to score points. 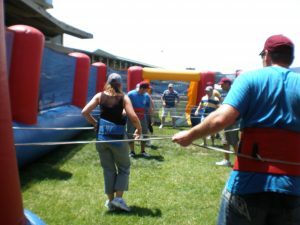 We provide our Big Bash program to small and medium sized groups and it is perfect for team building on a budget. It is light hearted, and is incredibly fun. It is the small scale version of ‘It’s a Knockout’. You will score points based on merit and on how you perform together as teams in games which involve building, stepping, navigating over, in and out, of the numerous the team challenges. With a wide selection of activities, Big bash is a team extravaganza event which is more cost effective, than the larger scale ‘It’s a Knockout’ multi activity programme. MC’d and themed with specific games, activities or inflatables for the program. Big Bash is a bold sports competition consisting of 8 -12 team based events. Fun, friendly but highly competitive. Contact us direct on 0410 645 728 for this program and other fantastic fun team activities.